MPs, celebrities and business leaders have launched a campaign calling for a public vote on the final Brexit deal between the UK and the European Union. The People's Vote - which held a rally in Camden, north London, on Sunday - aims to unite anti-Brexit groups. Organisers said some 1,200 people were at the event, including MPs from all leading parties. Pro-Brexit campaigners also gathered outside. Both the Conservatives and Labour have ruled out a second referendum. 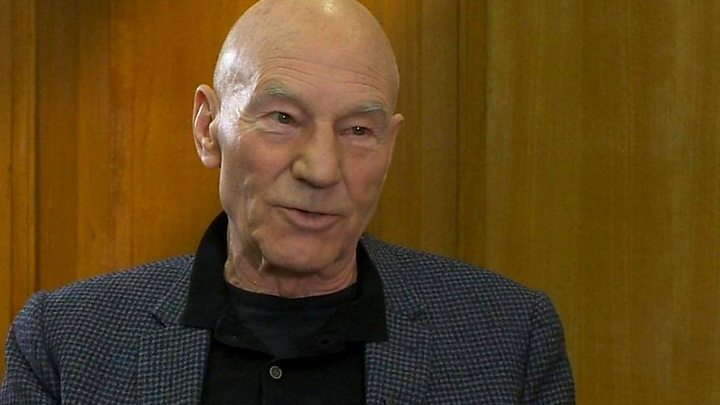 Actor Sir Patrick Stewart, who played Charles Xavier in the X-Men films based on the comic books, said the famous character would have voted Remain. He told the rally: "Unity, common cause, wellbeing of society and debate were paramount to the belief of this fictional character. "Our country's future is at stake and we will not stand idly by. "That is why I support a people's vote on the final deal." Britain voted to leave the EU by 51.9% to 48.1% in June 2016. The UK will formally cease to be an EU member in March 2019, and the two sides hope to reach a final deal on the terms of its exit by October - in time for it to be ratified by UK and European parliaments. Speaking to the BBC at the event, Labour peer Lord Adonis said: "People want a say... it was a vote in the dark two years ago. "No-one had any idea what the consequences of Brexit were going to be." And Green Party co-leader Caroline Lucas told attendees that Brexit was "not inevitable", adding: "We'll do everything we can in Parliament for a people's vote. This issue is far too important to leave to the politicians." Conservative MP Anna Soubry told the crowd the UK was about to embark on a course that would "make you and your grandchildren... less prosperous than you are now". "I think the best and right thing to do is to put it back to the people and say you can have a vote on this deal," she said. Chuka Umunna, MP for Streatham, said: "We need more Conservative members of Parliament to be as brave as Anna and many others who defied the whip and put their country before their party." Lib Dem Layla Moran said: "Whether you voted to Leave or Remain... there is nothing more democratic than allowing the people to accept or reject a deal that will affect our country for decades to come." Meanwhile, pro-Brexit demonstrators also turned up at the launch, and Conservative MP Nadine Dorries argued there was no public appetite for a second referendum. Appearing alongside Mr Umunna on ITV's Peston on Sunday, she said: "A second referendum, Chukka, which is what you're really campaigning for, is never going to happen. The public don't want it." Earlier, actor Sir Patrick told the BBC's Andrew Marr Show that the "terms and conditions" of Brexit were "quite unlike" how they were presented during the run up to the 2016 referendum. 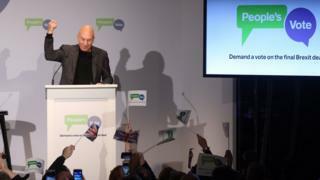 Sir Patrick also said he was motivated by "history and emotion" to want to stay in the EU. "I'm a war baby and growing up a lot of the world was not good. So the day we joined was one of the most exciting days of my adulthood," he added. "They voted with a substantial majority to leave the EU. We're now trying to deliver on that mandate from the people." Mr Johnson addressed the remarks made by Sir Patrick, who also played the role of Captain Jean-Luc Picard in Star Trek: The Next Generation. "I think we'll get a great result and we'll be able to have, not only a gigantic free trade deal with our friends and partners across the Channel, but we'll be able to boldly go to areas we perhaps neglected over the past five years."